The Zoom method for lifting stubborn stains from your enamel utilizes high-powered bleaching agents that act fast to brighten your teeth by as much as six to 10 shades. Preparation – Before any work begins, your lips, gums, cheeks and other soft tissues are isolated to prevent them from coming in contact with the whitening agents and being irritated. Application – The next step is to apply the whitening gel, which contains all the properties necessary to brighten your teeth by as much as 10 shades. Activation – The gel is activated using a special light that your dentist will shine on your teeth. He or she will then allow 20 minutes for the whitening agents to work. This process is repeated up to three times to get the desired results. Fluoride Treatment – Because the deep-penetrating whitening gel can cause sensitivity, your visit may conclude with a fluoride treatment to help prevent any discomfort. Over the years, OTC whiteners have gained popularity because they cost less and offer patients more convenience. When it comes to results, though, they lack severely when compared to the Zoom method. For starters, there is a major drop-off in the quality of ingredients used. Thus, the results are less drastic, and it takes longer to see any signs of change in your teeth. Because of this, people are sometimes tempted to apply more than they should and risk permanently damaging their enamel and irritating their soft tissues. 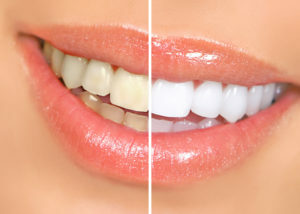 Visiting your dentist in Annapolis for professional whitening is more than just a way to get great results. It also provides you with the safest way to whiten your teeth. Your dentist will use his or her expertise to ensure that only the necessary amount of whitening gel is used and that your enamel is not severely damaged in the process. When the procedure is done, you’ll leave the office of your Annapolis dentist with a completely revamped smile and more confidence. You’ll definitely be ready to make the absolute best first impression from then on! Dr. Earl Chambers earned his dental degree from the University of Maryland Baltimore College of Dental Surgery and has gone on to serve the Annapolis area for over 20 years. Additionally, he maintains membership in the Academy of General Dentistry and the American Academy of Cosmetic Dentistry, which helps him provide his patients with the absolute best in cosmetic dental care. Dr. Chambers whitens teeth at Chambers Family Dentistry and can be reached for more information through his website.